Fig. 83—Trying the screw upside down in the counter3unk hole will indicate whether the countersunk portion is deep enough. Fio. 84.—Counter-bored holes may be Uited to sink round-headed screws below the .surface. Sometimes when round-headed screws are used, the holes are counter-bored to sink the heads below the surface. 84. 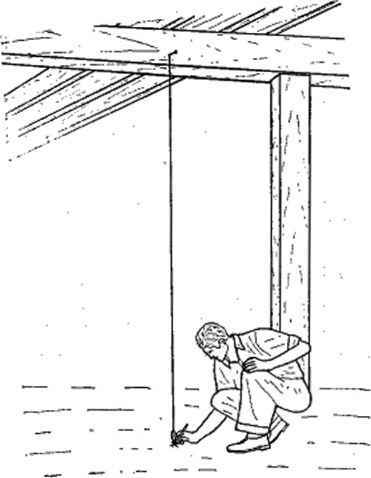 Using the Screw Driver.—The screw driver should be properly dressed and of a size that fits the screws. 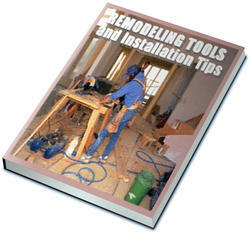 (See page 104 for methods of dressing screw drivers.) A screw-driver tip that is rounded or beveled may slip from the slot and mar the work and the screw head. A screw driver that has a blade that, is too wide will roughen or tear the wood around the screw head. 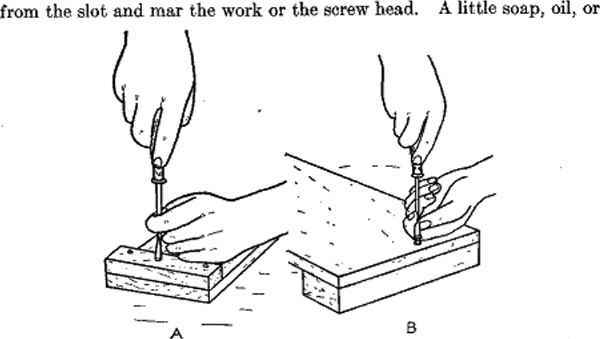 In using the screw driver, the handle should be grasped firmly in the right hand with the palm resting on the end of the handle and the thumb and first finger extending along the handle. While the right hand gets a new grip on the handle for the next turn, the screw driver should be held steady with the left hand and kept in the slot in the screw head. Fia. 85.—Two good method» of using the »crew driver. While the right- hand gets a new grip ou the handle for the next turn, the left hand holds the bit steady and keeps It in the screw slot. wax applied to the threads of the screw will make it go into the hole more easily.